It is rich in various plugins. It is MVC (Model-View-Controller) based. It has a clear and easy to manage admin panel. You can use it free of charge. If you want to provide your customers with good loading speed, you need to use CDN, read our instructions how to integrate CDN with OpenCart. Upload admin and system folders to the document root of your Opencart website. Log in to the admin panel of your Opencart. Go to Extensions → Modules. Click on the install button on the right side. Now we need to do two minor changes in the extension source code. Open file /admin/controller/module/cloudcache_cdn.php, find private function validate and at the first line of the function body add. Open file /config.php and at top of the file add. Click the edit button on the right side of modules list in the CloudCache row. 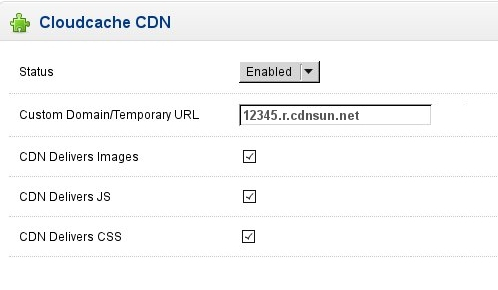 Enable the extension and fill in your CDN domain as in the picture below.